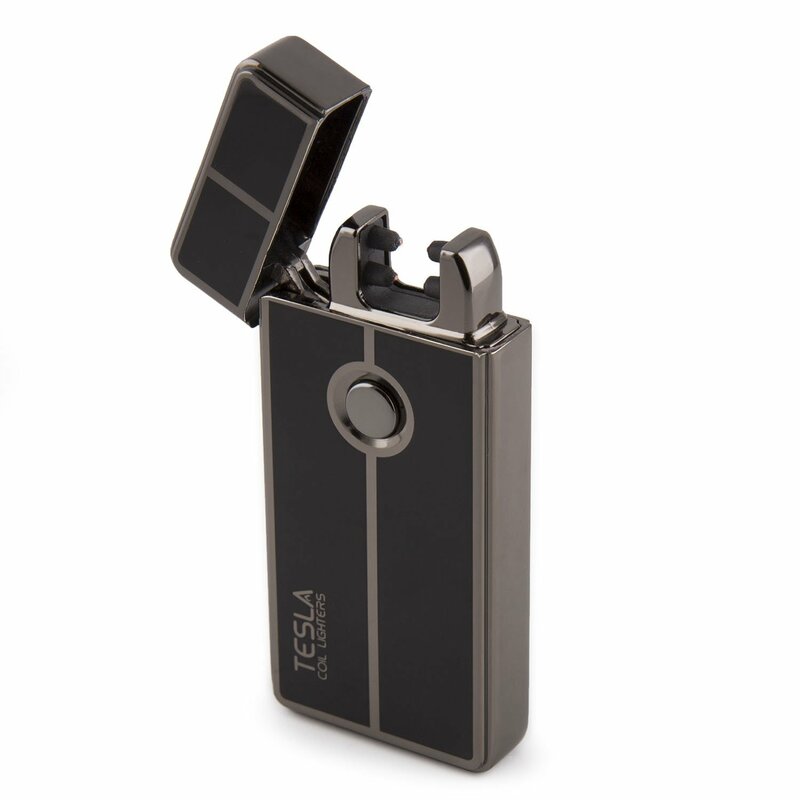 NO FLAME, NO BUTANE, NO HASSLE: Tesla Coil Lighters' Arc Lighter works by creating an electric arc with one press of a button so you can light up anytime, anywhere! Truly FLAMELESS and WINDPROOF technology. USB RECHARGEABLE: Plug the lighter into your car, computer, or any compatible USB port! A full charge can last up to a week or 100-300 uses. What does this mean? No more lighter fluid refills or throwing out those cheap plastic lighters - Economical, environmentally friendly and convenient! SAFE AND RELIABLE: Safety lid feature ensures that the Arc Lighter will not accidentally turn on when not in use. Take charge and be worry-free when you slip it into your pocket or bag for on-the-go use. QUALITY ASSURANCE AND CUSTOMER CARE: Here at Tesla Coil Lighters, we believe in forging the way with inventive new products designed for the modern world. We strive to provide simple, safe and reliable products backed by great customer service. Your Tesla Coil Lighter comes standard with a 1-year manufacturer's warranty. Color: TC 61478-GUN Necessity is the mother of invention, and few things have propelled humanadvancement more than harnessing the power of fire. Take the next step withTesla Coil Lighters in hand - the modern day solution to traditional lighters,because who has time to fuss with butane, wait for a flame, or fumble withspark wheels? Forge your way into the future alongside Tesla Coil Lighters,where we light the way with innovative electric lighters designed for themodern world. Our electric lighters are simple to use, safe, reliable,flameless and therefore truly windproof, with sleek and sophisticated designsthat are sure to catch the eye and spark conversation. Take charge with the Arc Lighter from Tesla Coil Lighters, a rechargeableelectric lighter that requires no flame, no butane, and no hassle! Thisinnovative lighter works by creating an electric arc with one press of abutton. Simply charge up via USB and you're ready to go -- Anytime, anywhere.Since the lighter uses no flame, it is not only windproof, but also economicaland environmentally friendly. No more lighter fluid refills or throwing outthose cheap plastic lighters! The lighter also has a safety feature, so itwill not light up when the lid is closed. Stash it in your bag or pocket anddelight in the freedom to take the Tesla Coil Lighter anywhere, withoutworries. WARRANTY - Your Tesla Coil Lighter comes standard with a 1-year manufacturer'swarranty which only covers manufacturer defects and does not apply to wear andtear from normal usage, misuse, mishandling, or unapproved modifications. Forwarranty service, please contact your authorized seller. DISCLAIMER - Tesla Coil Lighters and its agents will not be held responsiblefor any and all liability related to improper or unintended use ormodification of the product. The purchaser, user, or participant assumes allrisk of injury from any use.